16th August: Martin called from Lake Issy Kul – the team have joined up with our other expeditioners from Khan Tengri and they’re all happy and relaxing by the Lake, ready to head off tomorrow back to Bishkek and then home. 21st August: Andy has called this morning. 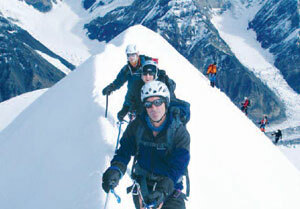 A successful ascent was made of Korona Peak, the highest peak in the area at 4860m. The conditions are difficult as it is very hot, 25 degrees at 4000m in the shade! They are thinking of heading back to Bishkek tomorrow before going to relax at Issyk-Kul Lake. Alpine Tien Shan Expedition News 24th July 2010. 4th Aug – The team have now returned to Tamga today and are relaxing before their journey back home. The team successfully managed to scale a 4450m peak. Andrew McCluskey decided to stop at a Col at 4350m and waited for the group to return from the top. Well done to all. Alpine Tien Shan Expedition News 2nd August 2008.